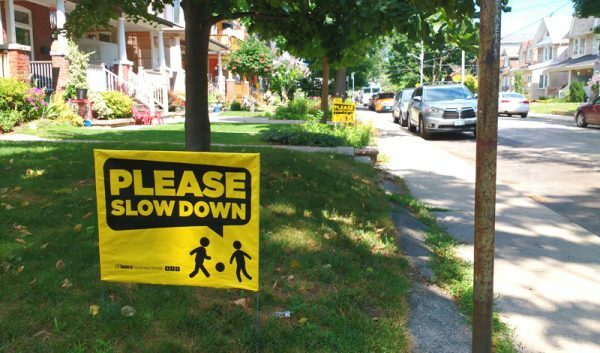 “Slow Down, Kids at Play” lawn signs proliferated in Toronto in the last couple of years as part of a private campaign in the wake of the death of a child hit by a car in Leaside. There was also some scorn about the effectiveness of such lawn signs — a feeling that they may make people feel like they’re doing something, but they don’t actually make a difference in reducing speeds. However, digging into the literature, there is some evidence that shows that these kinds of signs can reduce speeds somewhat. A study of a similar lawn sign campaign (“Keep Kids Alive”) in Oceanside, California showed that the campaign reduced speeds by 16%. That may not sound like much, but it could be the difference between going 45 km/hr and under 40 km/hr, or 40 km/hr and 35 km/hr, on a residential street — and we know that even a small reduction in speed makes a big difference in fatalities and serious injuries in this speed range. One study (PDF, p. 2) concluded that, on residential streets, a 1 mile-per-hour (1.6 km/hr) reduction in average speed would result in 6% fewer collisions. Many questions remain unanswered — for example, how many signs are needed on a street before they have an impact? Is the effect permanent, or just temporary? More studies would certainly be useful. But if the signs do work, why would they work? I can think of two possible hypotheses. First, it makes the environment more complex for drivers by adding another visual element, one intended to stand out. The more complexity a driver has to deal with, the more they will have to process as they drive, and they will tend to instinctively drive more slowly in order to be able to assess it all. That’s why painting the street, adding street trees, shared streets, and naked streets all work, in their different ways, to slow drivers — they push drivers to be aware of their environment rather than just proceed instinctively. This effect may wear off for habitual drivers on a street, but those drivers may be affected instead by a second possible reason these signs work: that people are influenced by knowing what their peers do or expect. For example, telling people that most of their neighbours voted can make it more likely they will vote themselves. Similarly, discovering that most of your neighbours (or the people on the street that you are driving through) expect you to drive slowly may subtly influence you to behave that way (this is sometimes described as one of the “nudge” techniques for influencing public behaviour). Finally, another use of lawn signs is reminding city councillors that their constituents think that reducing speeds and increasing safety is important. This might help persuade them to reduce speed limits (as Toronto East York Community Council did on all its local streets) and invest in the real physical changes needed to improve safety (for which Toronto’s recently passed Road Safety Plan is a very limited beginning) — but only if this sentiment is translated beyond everyone’s own local street. For all that, they remain a temporary, stop-gap measure. And they are focused on residential streets, while most accidents happen on faster main streets (where many people also live). The permanent way to reduce speeds is to reduce speed limits and invest in real changes in infrastructure (bump-outs, raised intersections, narrowed streets, street trees, etc), not only on residential roads but also on main streets across the city. Like that episode in Modern Family. “Slow Down Your Neighbors”? On my street, there is a curve before the crossing. If you speed, you’re unlikely able to stop. On top of that, it’s across a school, a city park near a major mall so the street attracts a lot of cyclists passing through. The cyclists often speed or ride on sidewalk, making it even more dangerous. In 2013, they put up a speed detector sign in which the light flashes “Slow down! Your speed is____” when you go over 40 km/hr. I thought it was brilliant. It offers feedback to drivers. The major street are 50km/hr, sometimes one forgets to slow down when turning in the small street. Then it attracted a lot of cyclists trying to go over 40km/hr, to trigger the light. They gather at night after 7pm to have fun. Making it more dangerous. They tore it down last year. I think the political impact of the signs is important, in terms of bringing about long term change. My own street is in a downtown neighborhood of one-way streets. I often see people (particularly taxi drivers) driving at very high speeds, trying to cut through the neighborhood. Due to all the parked cars along the street, it would be very difficult for a driver going at high speed to notice a small child or dog darting out from between the parked cars. A neighbor led a campaign to install planters and alternate side parking, so that the street would no longer look straight. Thereby hoping to slow drivers down. Despite support from other residents, this got defeated. As an alternative measure, they then asked for speed humps. The city put it to a mail-in vote. They required a certain percentage of all street residents to write in to say they agreed. While the majority of respondents supported it, the number of those who took the time to respond was too small to meet the minimum. So no speed humps either. Enforcement of speed limits by police officers is a very poor alternative, since they can’t be everywhere all the time. I think therefore that to get any real change in favour of pedestrian safety, there has to be the political will to prioritize infrastructure for safe streets. Unless/until that happens, we’ll continue to get toothless safety campaigns without addressing the real underlying causes of excessive speed. In the event, my impression is that the signs make no difference, just as the “Baby on Board” signs are meaningless in the back windows of SUVs that often travel too fast and change lanes without signalling. Radar sensitivity settings and aperture capture is insufficient to detect cyclists, just as the magnetic strips to change lights at intersections is also unaffected by bicycles. Nice try though. Oh those dangerous cyclists! I’ll take research over anecdote any day. And “distracted driving” refers to distractions inside the car, not the external environment.